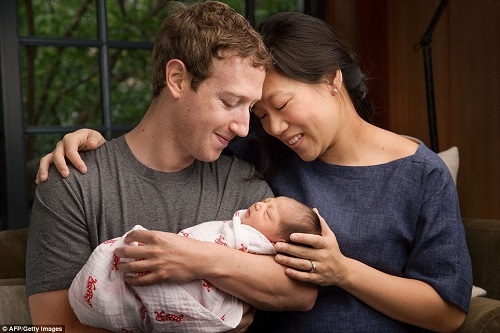 Facebook founder Mark Zuckerberg and his wife Priscilla Chan have welcomed their first child, a baby girl called Max into the world, and used her arrival to announce plans to give away most of their $45 billion fortune. The young billionaire and his doctor wife shared the news of the baby's birth in a Facebook post titled, 'A letter to our daughter'. In the lengthy post was the couple's pledge to donate the vast majority of their fortune to future generations. They will donate 99% of their Facebook shares currently valued at $45 billion - to the work of a new charitable foundation, the letter claims. That would leave them with $450 million for themselves and their new child - based on Facebook's current valuation, plus any other private wealth held by the couple.